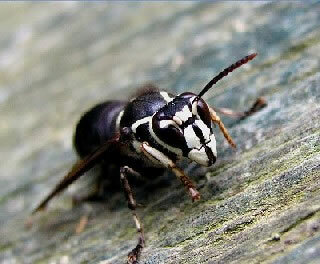 The bee's stinger injects venom into the skin. The venom is what causes the symptoms. The main symptoms are pain, itching, swelling and redness at the sting site. Pain. Severe pain or burning at the site lasts 1 to 2 hours. Itching often follows the pain. Swelling. The bee sting may swell for 48 hours after the sting. The swelling can be small or large. Stings on the face can cause a lot of swelling around the eye. It looks bad, but this is not serious. The swelling may last for 7 days. Redness. Bee stings are often red. That doesn't mean they are infected. Infections rarely happen with stings. The redness can last 3 days. A severe life-threatening allergic reaction is called anaphylaxis. 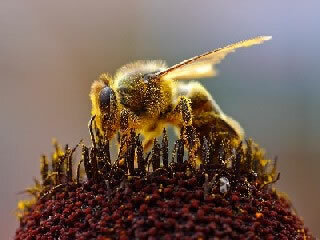 The main symptoms are hives with trouble breathing and swallowing. It starts within 2 hours of the sting. This severe reaction to bee stings happens in 4 out of a 1,000 children. Hives. After a bee sting, some children just develop hives all over or face swelling. Hives or face swelling alone may be able to be treated at home. But, at times, these symptoms can also lead to anaphylaxis. Be sure to call your doctor now to help decide. Don't go barefoot if bees are around. Be careful in gardens and orchards. Insect repellents do not work against these stinging insects. More than 5 stings for 10 pounds (5 kg) of weight. In teens, more than 50 stings. More than 48 hours since the sting and redness getting larger. Note: Infection is not common. It does not start until at least 24-48 hours after the sting. Redness that starts in the first 24 hours is due to venom. Swelling is huge (4 inches or 10 cm). It spreads across a joint such as the wrist. The main symptoms are pain and redness. The swelling can be large. This does not mean it's an allergy. Only honey bees leave a stinger. The stinger looks like a tiny black dot in the sting. 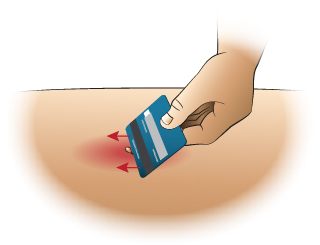 Use a fingernail or credit card edge to scrape it off. 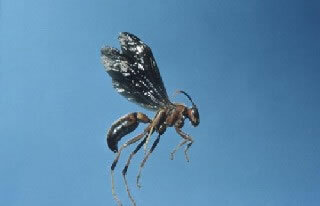 If the stinger is below the skin surface, leave it alone. It will come out with normal skin shedding. Make a meat tenderizer paste with a little water. Use a cotton ball to rub it on the sting. Do this once for 20 minutes. Reason: This may neutralize the venom and reduce the pain and swelling. Caution: Do not use near the eye. If you don't have any, use an aluminum-based deodorant. You can also put a baking soda paste on the sting. Do this for 20 minutes. If pain does not improve after using the meat tenderizer paste, rub with an ice cube. For itching or swelling, put 1% hydrocortisone cream (such as Cortaid) on the sting. Use 3 times per day. For hives or severe itching, give a dose of Benadryl. Severe pain or burning at the site lasts 1 to 2 hours. Normal swelling from venom can increase for 48 hours after the sting. The redness can last 3 days. The swelling can last 7 days. Trouble breathing or swallowing occurs (mainly during the 2 hours after the sting). Call 911. This photo shows the typical localized reaction to a bee sting. 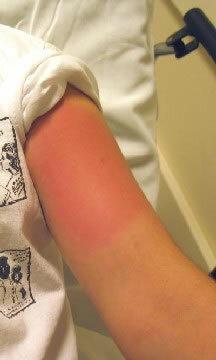 There is mild redness in an oval 4 inches (10 cm) wide of the left upper arm. 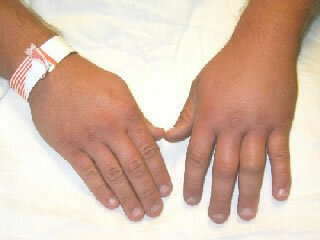 Moderate swelling of left hand from a bee sting that occurred the day before. 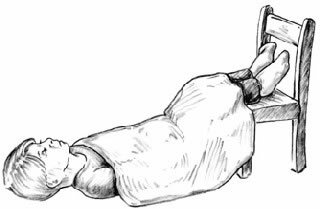 Lie down with the feet elevated (Reason: counteract shock). The stinger looks like as a tiny black dot in the center of the sting. There are several different methods of removal. Removing the stinger quickly is more important than the type of removal used. You can scrape it out with a credit card or finger nail. You can also use adhesive tape. If only a small fragment remains, don't worry about it. It will shed with the skin. In many cases no stinger will be present. Only bees leave their stingers. Wasps, yellow jackets, and hornets do not. 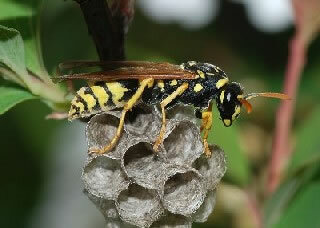 A paper wasp (Polistes dominulus) in its nest.